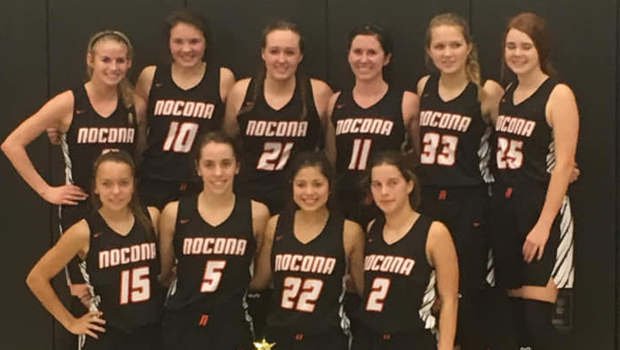 The Nocona basketball teams had a banner weekend, with both boys and girls teams going undefeated at their respective tournaments to win the overall tournament championship. The Indians went 4-0 to win the tournament in Jacksboro while the Lady Indians went 6-0 to win the tournament at Valley View. The Nocona boys came into the tournament having lost closely its first two games of the season against Archer City and Lipan. They came in needing to see some good things happen for them before folks started to panic. The Indians easily won their opening game of the tournament against Midway 49-26. Nocona’s next game was against tournament host Jacksboro. The game was closer, but the Indians still ended up winning easily 58-42. Nocona got a measure of revenge in their next game as they got a rematch against Archer City, who beat them to open the season. Showing how far the Indians have come in such a short time, Nocona was able to win by double digits 51-40. The win got the Indians into the tournament championship game against Godley on Saturday. It was a close game that went into overtime, but Nocona was able to come out on top 47-43 to earn overall tournament champion. The Nocona girls were able to stay undefeated despite playing six games in three days at the tournament in Valley View. The Lady Indians played its first game against Blue Ridge. They were able to expand their lead to double digits in the second quarter and never looked back as they won 48-31. Averee Kleinhans led the team with 28 points while Laramie Hayes was second with six. Nocona next played Boyd. The Lady Yellowjackets hung in with the Lady Indians for a half to keep the game within single digits, but Nocona pulled away in the second half as they won easily 59-32. The Lady Indians first game of the second day was against Bonham, who did not stand a chance as Nocona won 47-28. Tournament host Valley View was up next and gave the Lady Indians their best test so far as Nocona won a close and relatively low scoring game 37-30. The Lady Indians had a rematch against Boyd and the game was much different to the first game. Down 41-32 heading into the fourth quarter, Nocona was able to lock in and pull out the 44-43 win thanks to their defense. The win put them in the championship game. In another rematch, the Lady Indians faced off against the Lady Eagles from Valley View. The game was much more high scoring than the first matchup and much closer. The game went into overtime, but Nocona was able to pull out the win 56-52 to win the overall tournament.